Discover this gourmet mushroom of unparalleled taste. This kit allows you to ease your experience of growing gourmet mushrooms from upcycled coffee grounds. Simple as Open, Spray, Pick. Produced respecting the environment and the health of human beings, our kits are entirely free from fertilizers and pesticides. Harvest your first Oyster mushroom flush within 20 days. 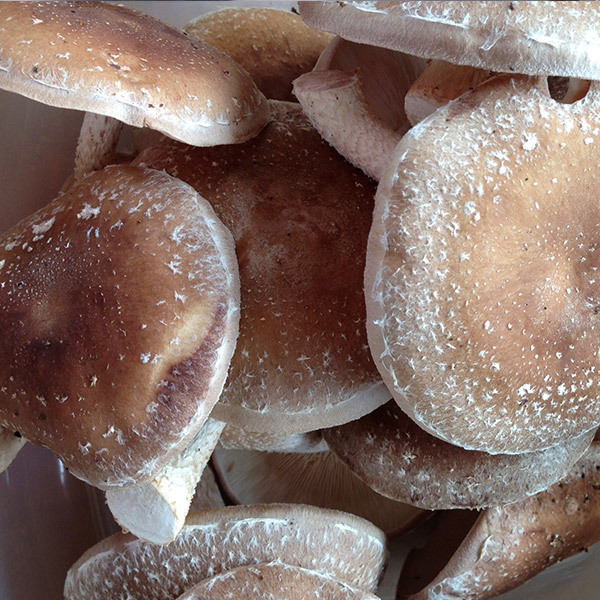 Will produce about 150g of gourmet mushrooms every 2 weeks, 4 flushes in a row. Submerge again in cold water for 12 hours after first flush to reinduce growth! One Homegrown Mushroom mycelium growing kit box can produce up to 1 pound and a half of fresh mushrooms over 2 months, or inoculate up to 5 times its mass ad vitam æternam. Extraordinary permacole innovation - our mycelium allows to revaluate garden residues as well as many organic household residues into a food source in the mushroom growing substrate! Our packages are done in a traditional way, right in Montreal. The raw materials used are collected within a radius of less than 2 km from the production sites in order to reduce the ecological footprint. Deliveries and postal items are grouped together as much as possible following this same desire to reduce the collective ecological borrowing. Homegrown Mushroom kits use a technique stimulating the mycelium's immune system to prevent the proliferation of ambient contamination.